Ubisoft's hugely anticipated bump-off sim created quite the controversy, though oddly not for the stylish and quite visceral violence it so gleefully inflicted upon authority figures. 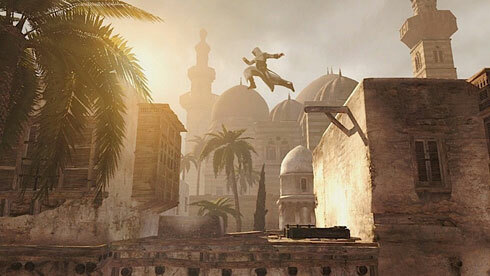 Instead, Assassin's Creed (or Assassin's Crud, depending on who you ask) divided critics, with some being utterly engaged by the game's unique setting and others thinking the same environment to be remarkably empty. Count us among the former, as we've yet to see a bigger, more lavishly detailed and immersive world than the one dashed through, clambered up and vaulted over in Assassin's Creed. The game's greatest design flaw may be that it's a bit too open-ended for its own good, refusing to overtly reward or punish players for behaving in a specific way. If you wish, you can spend a lovely afternoon playing Maniacal Guard Killer's Creed instead, carrying out your missions with all the stealthy maneuvering of a grand piano rolling down an escalator. Would it have been wiser for Ubisoft to beat you over the head every time you set off a medieval alarm and otherwise played the game "wrong?" Perhaps... but isn't the point of open-ended gameplay to let you choose your own path? In many ways, Assassin's Creed is more of a role-playing game than most of the titles officially labeling themselves as such. When you play as Altair -- really play as him, as an assassin -- and measure failure according to your own actions and not what a Fission Mailed screen tells you, the game's intricate world becomes inescapably engaging. Learn about your target, plan your attack and revel in the absolutely thrilling chase that follows your murderous deed. Though the game's overall structure may seem repetitive in the face of such a believable world, the true magic in Assassin's Creed lies not in what you do, but how you do it.